In recent years, I have developed a love for watches. Big ones, small ones. Pretty ones and functional ones. I came across Jord watches and FELL IN LOVE! They have so many unique designs that people will do a double take to look at the design. What makes your Jord watch a unique watch? Well, they’re wooden! The way they move with your wrist movements when you are walking around and even just sitting, yelling at the debates and pointing at the screen. (Come on, you ALL know you’ve been doing it this year!!! I won’t believe you if you tell me otherwise! LOL) They are so lightweight despite their size. Yes, they are big! I didn’t realize right away, but my watch, I had chosen the Dark Sandalwood & Blue Carbon watch from the Delmar Series because I like bigger watches, is 44mm across. With that said? I loved it! While out driving, or even typing away at my current book, I didn’t feel hindered.You can see more men’s watches by clicking the link. If you like a rounder design, but, love this color? They have the Fieldcrest Dark Sandalwood women’s watch. That one is slightly smaller at 39mm across. It comes in a beautiful gift box if you choose to give it as a gift. You just slide the lid out to open it. It also comes with a cloth to wipe any smudges off the facing. JORD and FLIGHTS OF FANCY MOM are giving you the chance to receive a $75 gift voucher to JORD! Grab a watch for yourself as a unique gift. JORD offers styles for men and women. One lucky winner will receive $75 gift voucher toward a JORD watch of your choice. And don’t forget! Everyone who enters will also receive a $20 voucher to spend on their own JORD watch. Everyone is a winner! 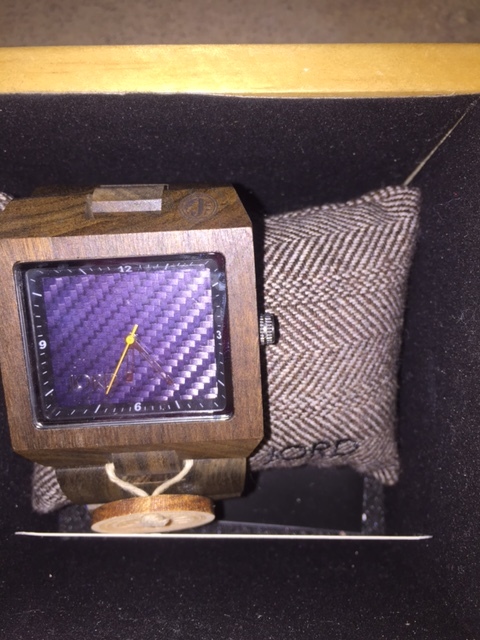 The winner is automatically picked and notified via email by JORD WATCHES! Contest ends on October 16th at 11:59pm EST. The $75 gift code will expire one month after the contest ends. The $20 gift code will expire four months after the contest ends. So, make sure you use them! Disclosure: This post was sponsored by JORD Wood Watches. I did receive a watch to review. However, all opinions are my own. ← Is it Depression or Just A Funk? I’ve seen JORD watches online… I love the purple color, so beautiful!